A pulled pork sandwich at Poe's Tavern. Photo courtesy of Poe's Tavern. CHARLESTON, South Carolina – The beach bum, the adventurer, and every traveler in between will feel at home in Charleston. Have your slice of Southern comfort served four different ways. There are miles of shores to explore. Boho surfer boys and girls convene at Folly Beach for relaxed waves, a swim, and kayaking. Post-beach, the crowd floats to Bowens Island Restaurant for warm fire pits, oysters, and hush puppies. Sullivan's Island is a nice family spot to beachcomb. Nab some ribs at Home Team BBQ and wash them down with the signature "Game Changer." 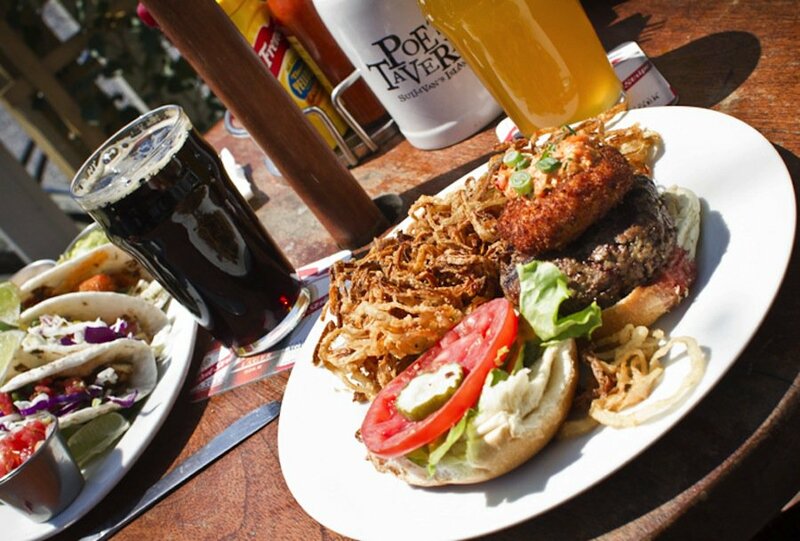 Poe's Tavern is serious about its burgers and oyster roasts. The more exclusive and private Kiawah Island is a wondrous nature preserve that has something active (golf, tennis, spa) for everyone. Soak in the lowcountry milieu by signing up for a saltwater or blackwater kayaking expedition. (Local outfitter Coastal Expeditions is great.) Paddle under ancient cypress trees and float by historic rice fields. The waters are teeming with crabs, while snowy egrets, herring gulls, and terns soar above. You might even spot an alligator in the sun (please do not disturb). Founded in 1687, Magnolia Plantation and gardens houses thousands of flowers that usher in the seasons. Middleton Place is brilliantly manicured and perfect for quiet reflection (don't miss the massive Middleton oak and stables). Fort Sumter is where the Civil War's first battle erupted. Don't rush past the unspoiled Charleston Tea Plantation, which produces 320 varieties of tea in a tranquil setting. Built in 1798, the pre-revolutionary Drayton Hall is the oldest unrestored American plantation house. Spend extra time on a peaceful marsh walk. Back in the heart of downtown, visit the wealthy Southern merchant Nathaniel Russell's house, a rectangular mansion showcasing a lavish floating staircase. The stunning gothic revival French Huguenot Church still reads its liturgy in French. It's worth wandering through St. Philips' cemetery, where former Vice President John C. Calhoun is buried. A ghost tour is a touch touristy but terrific. Look out for old generals, Daughters of the Confederacy, and lost spirits like Calhoun himself, who's been seen dancing in the streets for the last 150 years.